The 11. b. I.D. had left its positions near Muelhausen on the 25th of April to move to the Parfondru area, 8km. southeast of Laon. Here the division lay in reserve. The III./21.b.Fda.R., however, was sent into action right away to the south of Ailles in the 1. Garde Infanterie Divison (G.I.D.) sector. When on the fifth and sixth of May the enemy broke into the 20. I.D. positions on both sides of Cerny the 11.b.I.D. counterattacked. The first battalions into combat were the II./22.b.I.R. on the sixth of May and the III./3.b.I.R. on the seventh of May. They did not manage to retake the high ground to the east and west of Cerny, but at least the village itself remained in German hands. On the eighth of May the 11.b.I.D. had taken over the six km. wide 20. I.D. sector which angled north-westwards and north-eastwards from Cerny. The II./4.b.Fda.R. had been in this sector since the end of March. The 3.b.I.R. took up position in Cerny with the b.R.I.R.13 on their right and the 22.b.I.R. to the left. The 1. and 2. b.I.D. had spent the winter in the trenches near St. Mihiel. They were replaced at St. Mihiel by the exhausted b.E.D. and 5.b.R.D. 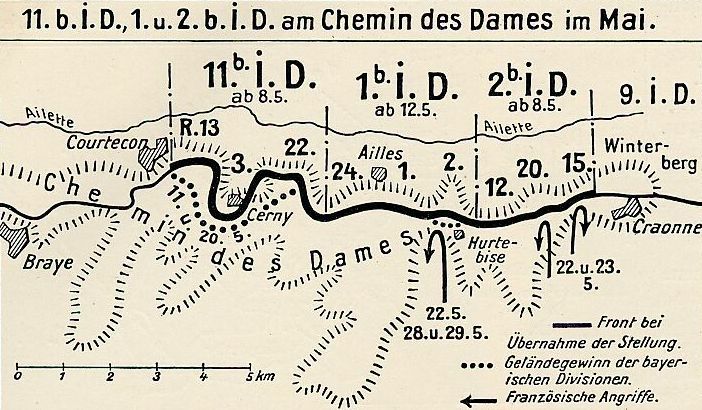 around the second of May and left to join the 7.Armee on the Chemin des Dames. The fighting had died down in this sector when the 2.b.I.D. took over for the 2. G.I.D. between Hurtebise and Craonne on the eighth of May but the 20. b.I.R. still had the opportunity to fight side by side with the Guards when their relief of the 3.G.I.Br. was interrupted by a French attack. Once the relief was completed the 20.b.I.R. was in the line with the 12.b.I.R. to their right and the 15.b.I.R. to their left. Craonne under fire in 1917. The 1.b.I.D. took up a position between the 11. and 2.b.I.D., replacing the 14.I.D. which in turn left to replace the 1.G.I.D. to the south of Ailles. The III./4.b.Fda.R. was already in the sector taken over by the 1.b.I.D. The days following the sixth of May saw no major offensives but there were many small actions, artillery duels, and barrages, many of great intensity. In many places, especially on both sides of Cerny, the Bavarians occupied miserable, badly damaged field defensive positions along the back of the plateau or on the slopes going down to the Ailette. In some sectors, like that of the right wing of the 2.b.I.D., the men were at the foot of the slope in full view of the enemy above. The fact that they held this position shows the determination of the defenders as the French above could monitor and shell the approaches over the low lying, swampy Ailette valley. About half of the infantry clung to the back ridge, a matter of pride not to be pushed down the back slope. All along the enemy was in close proximity. Faced with constant danger the men managed to turn their shelters and holes in the ground into a network of trenches, barriers and bunkers. Left: A Iron Cross document to a man in the 2. b.I.R., the award was made for bravery on the Aisne. The situation remained grave and it seemed the only way to gain a modicum of security was to retake the edge of the plateau all along the back of the ridge and then push the French back across the plateau and back down the front slope. By means of a number of local attacks, raids and digging saps towards the enemy a portion of the lost ground was actually regained by the Bavarians. Larger attacks were staged by the 11.b.I.D. on the 11th and 20th of May. The goal of these attacks was to improve the defensive positions. Attacking on both sides of Cerny, but mainly in to the east at Bovelle, the attacks were bitter close combat affairs. On the 11th of May all three regiments were involved. On the 20th of May however the struggle was carried mainly by the I./22.b.I.R. and elements of the 3.b.I.R. who fought from morning to evening, fighting backwards and forwards over a small stretch of ground. Enemy counterattacks and heavy artillery fire stopped the German troops and even managed to throw them back in a few places but at the end of the day the enemy had been pushed back from the ridge, taking away their vantage points that allowed them to see down into the Ailette valley and across the German positions. Added to these successes was 340 prisoners taken by the 11.b.I.D. on the 11th of May. On the 20th of May the left wing of the 1.b.I.D., the I./2.b.I.R. assaulted the strongly defended enemy first lines at Hurtebise. Attacking with hand grenades they took the trench and held it against heavy counterattack and artillery barrage. 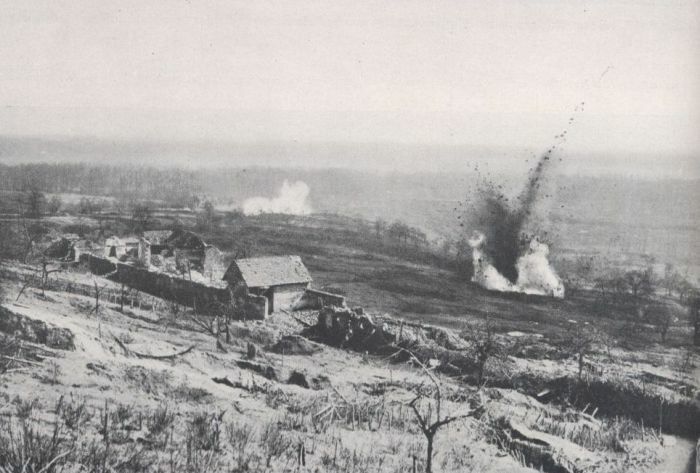 Already a few days before the 20th May the enemy had started a steadily increasing bombardment on the heights at Craonne, on the positions of the 2.b.I.D. and on the left wing of the 1.b.I.D. The enemy started to pound the newly made positions with heavy mortars and regularly fill the Ailette valley with gas shells. Often, as on the 14th and 17th of May, enemy attacks were broken up in front of the 2.b.I.D. by artillery fire. On the afternoon of the 22nd the drumfire that announced the coming attack started. The French advanced at 17:25, against the 9.I.D. who were on the Winterberg (Plateau de Californie), and against the 2.b.I.D. and left wing of the 1.b.I.D. The infantry in the German front lines, supported by their artillery, broke the back of the enemy attack, sending the French back with severe losses. The 20. and 15. b.I.R. of the 2.b.I.D. had caught the full fury of the attack, in many sectors hand to hand combat, man against man. Slight losses of ground were retaken with local counterattacks. There was no need to call on the reserves of the 41. I.D. which was in position behind the lines as a counterattack division. On the border between the 20. and 15.b.I.R. the 2.M.G.K./20.b.I.R. under Leutnant Goss had held an important and dangerous position on the days leading up to the big attack. With his three machine guns he broke up the waves of attackers in front of his positions and even managed to counterattack. The 12.b.I.R. was not attacked on the 22nd of May but they were able to participate by firing into the flank of the enemy attacking their neighbours causing heavy losses. 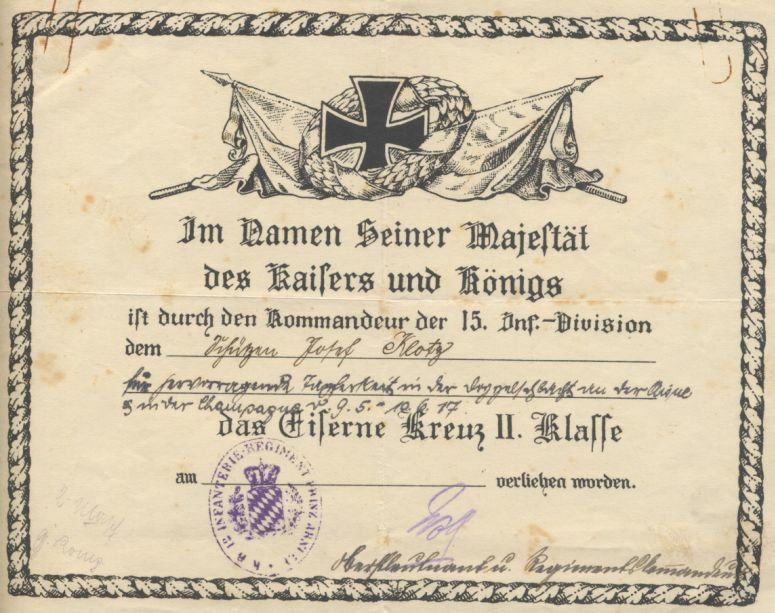 Below: An iron Cross award document to a machine gunner in the 12. b.I.R. mentioned in the action above. The 2.b.I.D. 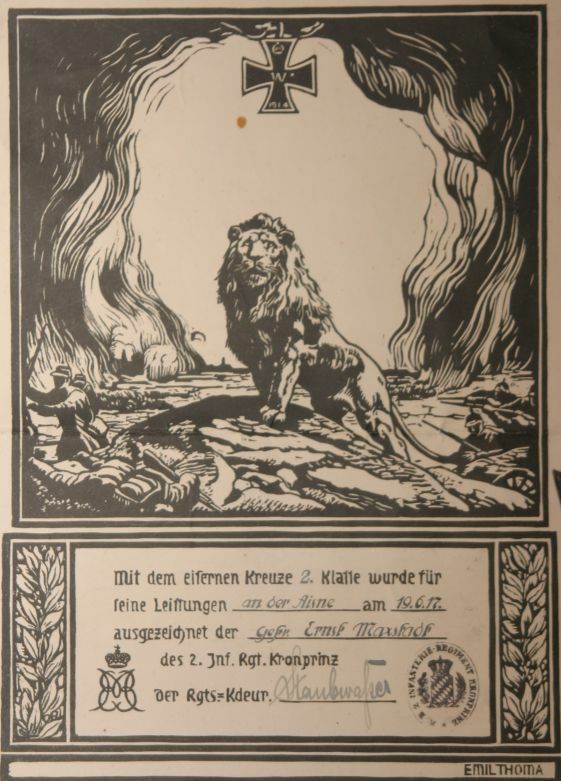 was bleeding from a thousand wounds; some battalions were reduced to 250 men. The II./15.b.I.R. could only field two companies of 80 men. The 2.b.I.R. of the 1.b.I.D. with its support batteries(1.b.Fda.R., III./4.b.Fda.R.) beat back enemy attacks against the left wing at Hurtebise. On the 23rd of May at 21:30 the French tried another attack against the 20th and 15th b.I.R. but once again they were beaten back. On the nights of the 24th and 25th the French trenches once again filled with assault troops but the attacks were stopped by German artillery fire. In the meantime the fight for individual shell holes continued. The 12.b.I.R. was relieved on the 24th of May by the I.R.152 and its men were sent to reinforce the 15. and 20. b.I.R. who had been severely reduced in strength. The lightly wounded, slightly sick and non assigned men were formed into a special battalion. From the 27th of May to the 10th of June the 2.b.I.D. was slowly relieved by the 15.I.D. and pulled to the rear. The French launched local attacks against the left flank of the 1.b.I.D. at Hurtebise on the 28th and 29th of May. The III./24.b.I.R. which had just relieved the 2.b.I.R., held them back, and a few weeks later on the 16th of June the I./24.b.I.R. succeeded in taking a section of the slopes to the northwest of Hurtebise in a well executed local attack. The tail end of the battle was also experienced by the newly formed 15.b.I.D., formed in March and having just arrived from Lorraine in mid May to assemble near Montcornet. The division was moved bit by bit to the la Malmaison sector and on the 21st of May it began to relieve the 213.I.D. in the area between the Corbeny - Pontavert road and Juvincourt. In the night of the 22nd of May as the relief was underway the French launched their last major attack which included a section of front line on the right wing of the 213.I.D. which the III./31.b.I.R. was relieving. A few positions were lost here as the enemy advanced a short way up the Corbeny-Pontevert road. The relief in the 213. I.D. sector passed with much less excitement but there was still great tension due to the threat of a further attack. The attack on the 22nd of May and the skirmishes that followed signalled the end of the Nivelle Offensive on the Aisne. The Bavarians had suffered heavy losses. The 11. b.I.D. had left 35 officers and 1500 men on the blood-soaked Chemin des Dames, the 1. b.I.D. lost 29 officers and 1243 men and the 2. b.I.D. 40 officers and 2100 men. The 2. b.I.D. was pulled back to the Charleville area in the middle of June, the 1. b.I.D. in the middle of July. The 11. b.I.D. stayed on the 7. Armee front until mid September. For the month of July the 11. b.I.D. was used as a counterattack division in the Cerny sector. The battalions had been pulled asunder, rushed to all the hotspots to counterattack or prop up the defence. 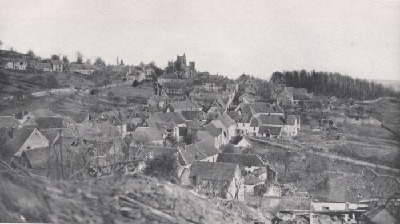 From the beginning of August to mid September the division took over a defensive sector on the western edge of the Chemin des Dames, the infamous Laffaux Ecke. The causalities for the division from the beginning of July were again heavy. Nineteen officers and 1350 men, including three bearers of the Max-Joseph order who were killed with a single artillery shell.